A fourth eGaN FET joins the range available from Efficient Power Conversion (EPC). The 100V, 3.8 mOhm EPC2053 eGaN FET, joins the EPC2045, EPC2052, and EPC2051. EPC says that its 100V family of GaN transistors are more efficient, smaller, and lower cost for high performance 48V DC/DC conversion. The EPC2045 (7 mOhm, 100V), EPC2052 (13.5 mOhm, 100V) and EPC2051 (25 mOhm, 100V) FETs are suitable for a range of power levels and price points to meet the increasing demands of 48V server, 48V automotive, and 54V data centre applications. Other applications for the 100V family include single-stage 48V to load open rack server architectures, USB-C, precision motor drives, LED lighting, and lidar, says EPC. 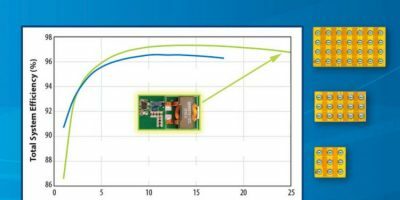 Performance advantages gained from GaN in 48V IN conversion can be exploited in artificial intelligence (AI), cloud computing, and advanced high-performance motor drives. Automotive systems are also moving from 12V distribution systems to 48V systems to support the emergence of autonomous vehicles with lidar, radar, camera, and ultrasonic sensors. “Our new family of 100V products demonstrate that in all 48V topologies, the highest efficiency and lowest cost is achieved with GaN FETs and ICs,” said Alex Lidow, co-founder and CEO at EPC. In all the topologies with 48 VIN, the highest efficiency is obtained using GaN devices due to their lower capacitance and smaller size, claims EPC. Recent price drops in GaN power transistors mean that cost comparison with equivalent silicon-based converters favours the use of GaN devices, according to the company. Achieving as high as 97 per cent efficiency, the 100V eGaN FETs can be evaluated using two new reference designs and five demonstration boards available from EPC. The EPC9138 demonstration board is a 400kHz switching frequency, 48V IN, 15A output current, buck converter featuring the 100V EPC2053. The EPC9141 demonstration board is a 400kHz switching frequency, 48V IN, 10A output current, buck converter featuring the 100V EPC2045. Standard half-bridge development boards are also available to support in-circuit performance evaluation of each of the 100V family devices. The EPC9093 supports the EPC2053, the EPC9078 and EPC9205 support the EPC2045, the EPC9092 supports the EPC2052 and the EPC9091 supports the EPC2051.